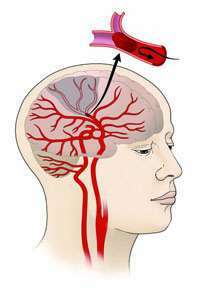 Ischemic stroke occurs when a brain blood vessel gets blocked. The gray area represents brain tissue that is not receiving nutrients as a result of the stroke. Credit: NINDS. Pioglitazone, a drug used for type 2 diabetes, may prevent recurrent stroke and heart attacks in people with insulin resistance but without diabetes. The results of the Insulin Resistance Intervention after Stroke (IRIS) trial, presented at the International Stroke Conference 2016 in Los Angeles and published in the New England Journal of Medicine, suggest a potential new method to prevent stroke and heart attack in high-risk patients who have already had one stroke or transient ischemic attack. This large, international study was supported by the National Institutes of Health's National Institute of Neurological Disorders and Stroke (NINDS). "This study represents a novel approach to prevent recurrent vascular events by reversing a specific metabolic abnormality thought to increase the risk for future heart attack or stroke," said Walter J. Koroshetz, M.D., director of the NINDS. "The IRIS trial supports the value of more research to test the vascular benefits of other interventions such as exercise, diet and medications that have similar effects on metabolism as pioglitazone," said Walter N. Kernan, M.D. professor of general medicine at Yale University School of Medicine, New Haven, Connecticut, and lead author of the study. The study evidenced an additional known side effect of the drug, which is an increased risk of bone fractures. To help doctors and patients choose the best strategy for preventing recurring strokes, future studies will attempt to identify a person's risk of bone fractures due to pioglitazone. As approved for use in medical practice, the drug also carries additional side effects (drug label). "More research is needed to determine the mechanisms by which pioglitazone decreases risk for stroke and heart attack and increases bone fracture risk, with the hope of developing strategies that maximize benefit and minimize serious side effects in our patients," said Dr. Kernan.